Tag Archives for " City Search "
You know I’m a supporter of the local review sites like Yelp! and City Search, but some small business owners have issues with the format. Here’s the dilemma, consumers do seem to like them because they offer an easy way to get some input on a business. Business owners take issue because they sometimes get bad reviews and feel they have little or no control over what’s said about them. The lawsuit was brought by a vet clinic in the San Fran area called Cats & Dogs Animal Hospital – one look at the reviews on the Cats & Dogs Yelp page and you kind of get the feeling this business has some issues. There are some very good reviews and some very bad reviews. I’ve found these review sites to be very accurately indicative of the health of a business. I suppose this is a good time to remind business owners to be proactive in getting their loyal fans to start the good review trend! Yelp CEO Jeremy Stoppelman had this to say about what he’s called the conspiracy theory. 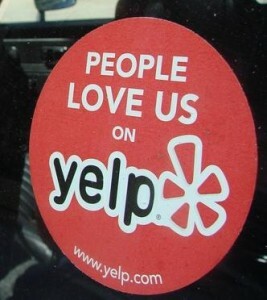 I did some further searching and found one attorney who thinks the Yelp! suit will get tossed quickly. I have no idea whether any of these allegations have merit, but I’ve witnessed how much effort Yelp puts into giving business owners a voice on Yelp and I for one think this shows how authentic their attempt to put out a balanced and necessary offering is.